PHOENIX, NY – After a long illness, Edwin J. Wells of Phoenix, NY, was reunited with his loving wife, Elaine Norma (Fields), in Heaven, on Saturday March 3, 2012. He had been a short-term resident of Morningstar Residential Care Center, Oswego, NY. Edwin was born September 5, 1923, in Oswego, to his late parents, Mabel (Horr) and Edward Wells. And later, predeceased by his sisters, Ethel Meeker, Ella Pelkey and Doris Wells; and a brother, Richard Wells. Ed will be remembered for his kind hearted, good natured human being, and his special knack, for making a people smile. He was a member of the D-Company 29th Infantry, Oswego, during World War II. Ed was a valued member of the Phoenix Volunteer Fire Department, Enterprise Fire Company, for more than 52 years. 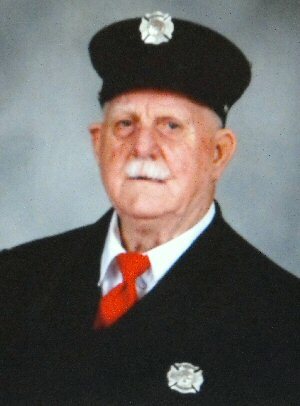 He was a member of VFW Post 5540 and a life member of American Legion Post 418, both located in Phoenix. Edwin retired in 1986 from General Electric, Syracuse, as a firefighter, with more than 30 years of service. Surviving are his two sons, Edward E. (Sandy) Wells of Genoa and Daniel A. (Joan) Wells of Central Square; one daughter, Deneen M. (Michael) Sufnar of Fort Walton Beach, Florida. ; one sister, Lillian Murray of Oswego; eight grandchildren; ten great-grandchildren whom he loved dearly; several nieces, nephews; and his in-laws; and a host of friends. His dedication to his community will be missed by many. Calling hours will be from 2 to 4 and 6 to 8 p.m. on Friday March 9, at the Allanson-Glanville-Tappan Funeral Home, Phoenix. The funeral service will be at 10 a.m. on Saturday in the funeral home, 431 Main St.
Burial will be in Phoenix Rural Cemetery, 126 Chestnut St.., with firefighter honors commencing during the committal service.